As of a couple of weekends ago, my wife Kamina and I have been married for seven years. We celebrated our anniversary by going to the Sunshine Coast for the weekend for fun and relaxation. 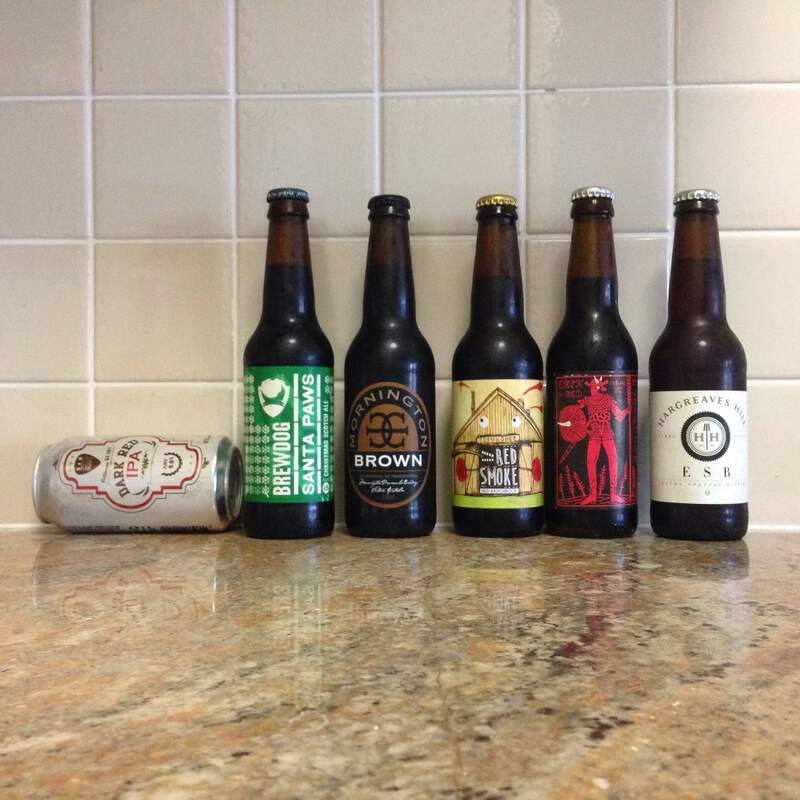 And as you may guess of a couple of people who share a passion for craft beer, we decided to include drinking some tasty brews in our celebration. After an hour and a half on the road, we rocked up to our holiday apartment and did what anyone in their right mind should do—dumped our bags and headed straight to the bar. 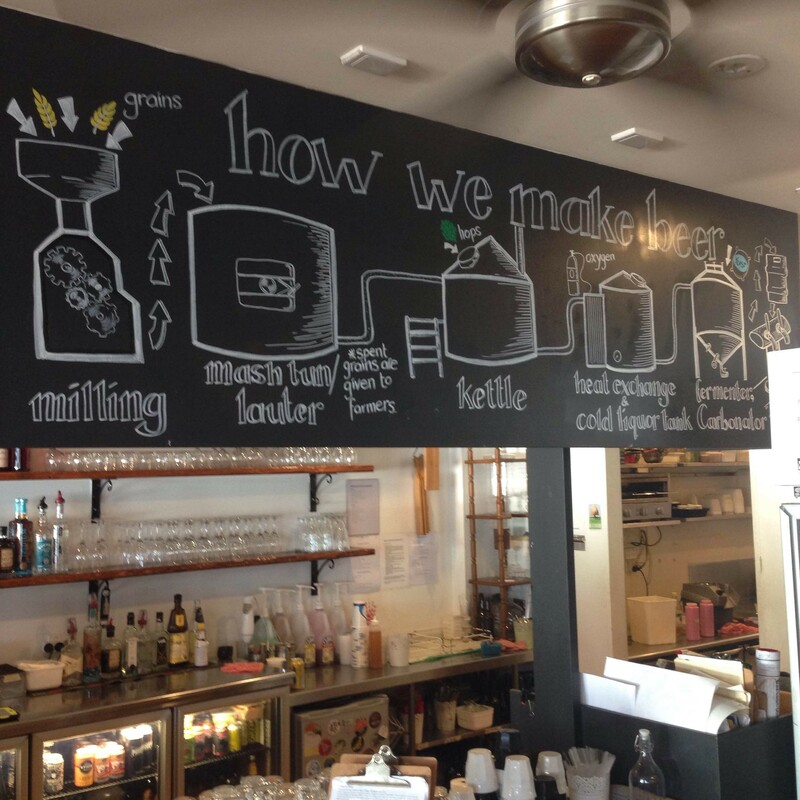 ‘The bar’ was our favourite Caloundra watering hole: Blackwater Trading Co, at Moffat Beach. 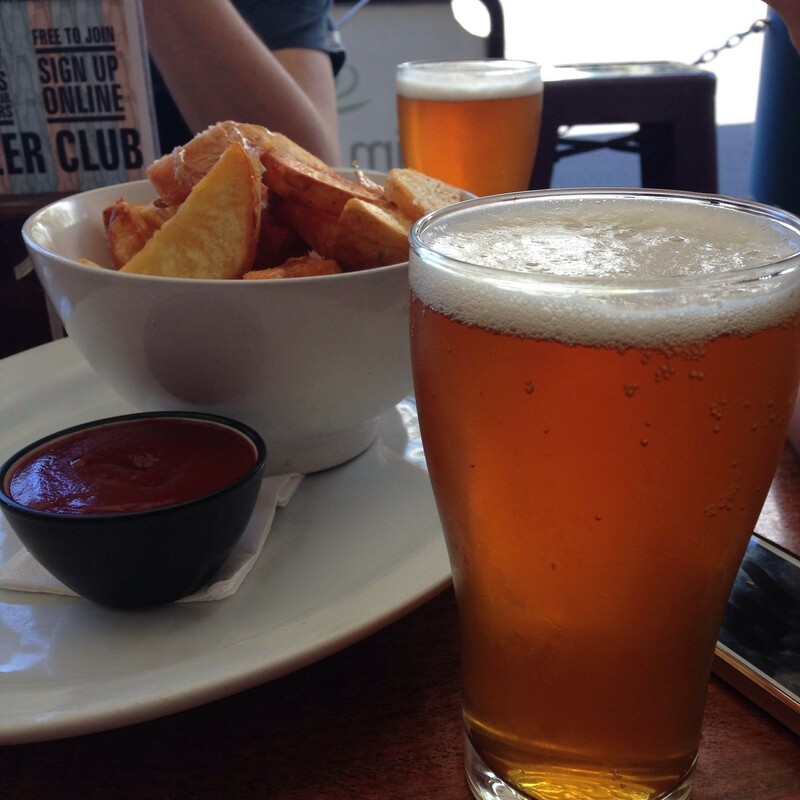 It’s a cafe/craft beer bar that’s also recently become home to the Moffat Beach Brewing Co. Great little spot. It was a hot afternoon and we were ready to melt straight into holiday mode. So after our little road trip to the coast, I had myself a big Road Trip, by Holgate Brewing. It teetered between a sweet start and a bitter finish—a gentle brew to lap away at the weariness of the day while the waves lapped away at the sand in front of us. After our switch-off beer and some of Blackwater’s signature handcut chips, we headed back to the apartment with some takeaway (Nepalese food for Kamina, chips for me)(have I mentioned I like chips?) and settled down in front of Breakfast at Tiffany’s with a Dark Red IPA by Six String Brewing Company, the first of 6 beers we’d brought with us. Now, if you haven’t tasted this drop before, you need to get onto it. This was the end of a six pack I got for Christmas, and the moment I finished it I felt ready to go buy some more. The bitterness starts the moment it hits your mouth, but isn’t overpowering. The caramel malts have a stand-off against the hops, and it’s not clear who the winner is. It all plays beautifully together. And because, for some reason, red ales and red IPAs are generally harder to get your hands on in bottle shops than they should be, it’s nice that Six Strings always has a six pack of these bad boys waiting for me on a shelf somewhere. The next day, 20 hours into our 40 our holiday (really never long enough, is it? 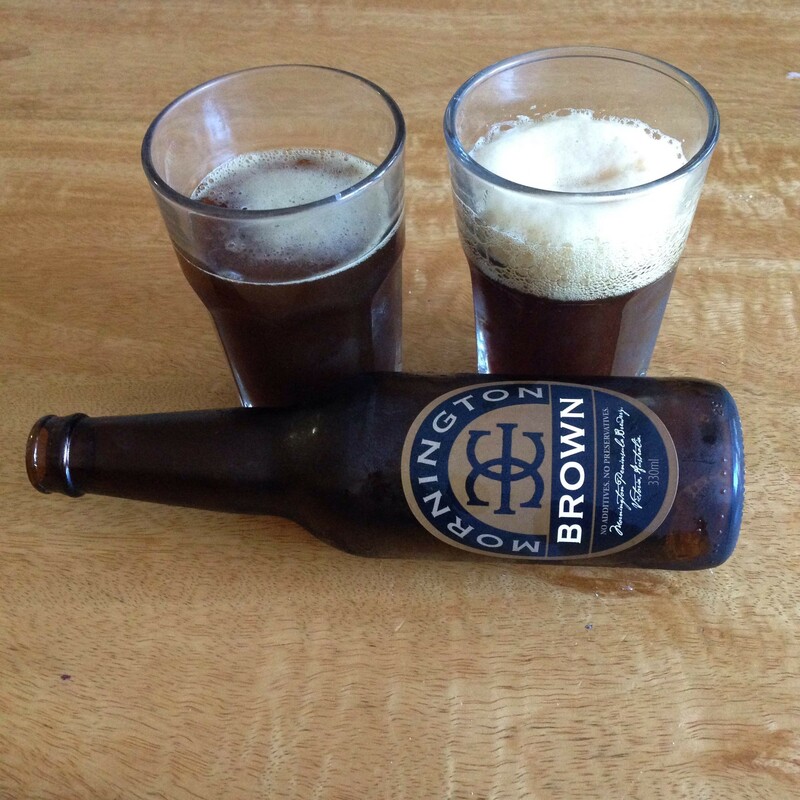 ), we cracked open a Brown by Mornington Peninsula, and a Red Smoke by Red Hill Brewery. I’d had the Brown before, but was again surprised at how smooth it is. Caramel and toffee and raisins and milk chocolate and cola all roll over your tongue together, and you can’t help but close your eyes. 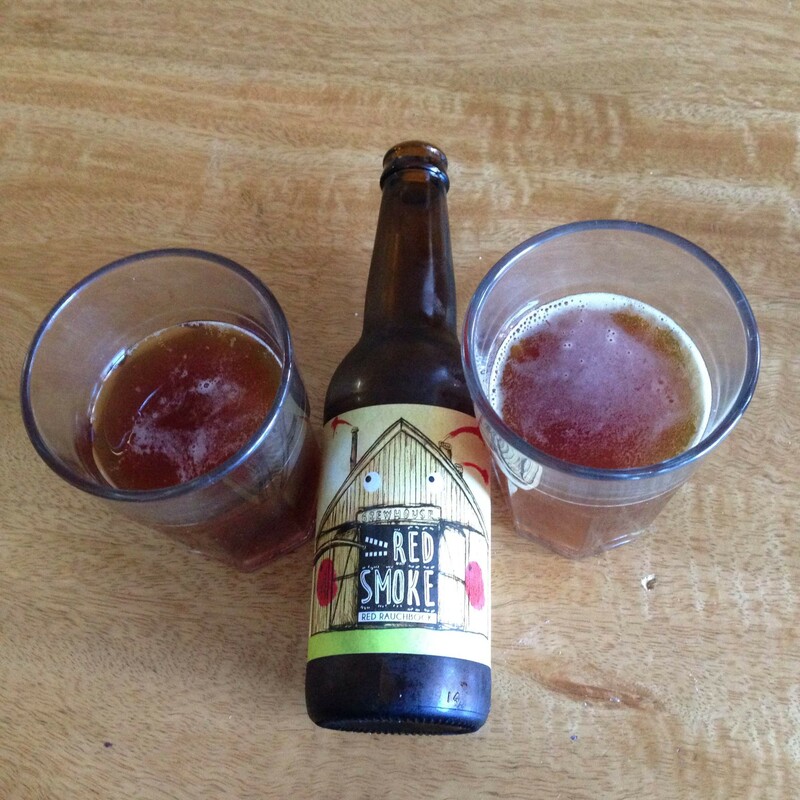 The Red Smoke almost has the opposite effect: rather than relax you, it puts your senses on high alert. 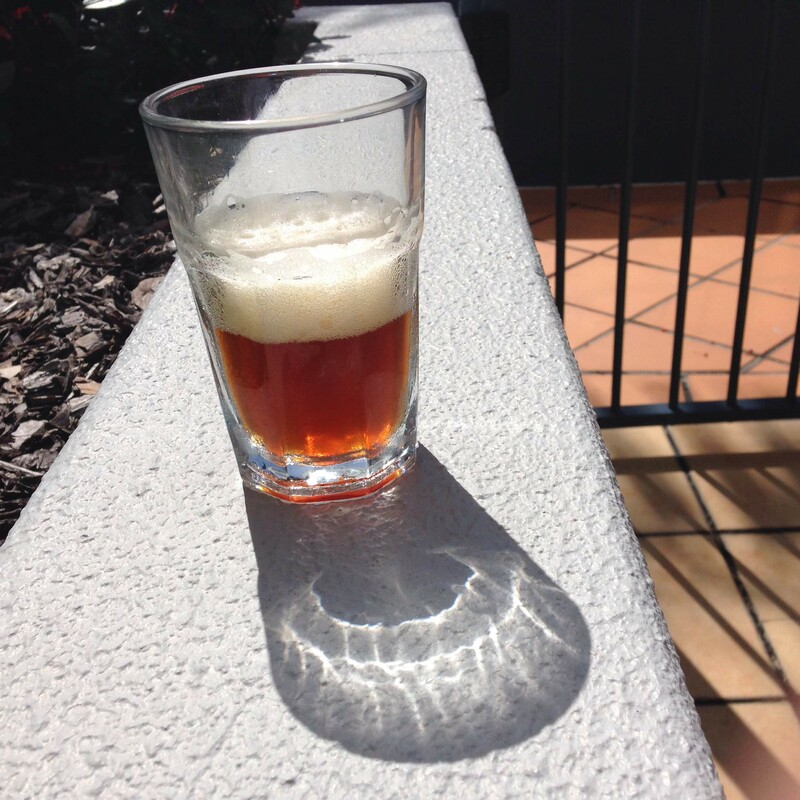 It’s an opaque burnt orange colour—you can almost see the smoke, which emanates from the glass with gusto. It fills your nose with savoury smoke tinged with sweetness, like you’re smelling a plate of bacon smothered with maple syrup. The smoke in the flavour is a little less intense, and comes through more as peat, while the sweetness is more like dried fruit. This was a beer that gripped all of your attention and wouldn’t let go until you were finished, and even then hung around in the background for as long as it could. Nice flavours, but perhaps a little too much of an assault on my tongue for my liking. A few hours after those, we were ready to see the water again, so after a little beach time we headed back to Blackwater for some Modus Operandi Pale Ale. Pale Ale by Modus Operandi. And chips, of course. That evening, the temperature finally dropped a little, which brought a perfect opportunity for a spa. 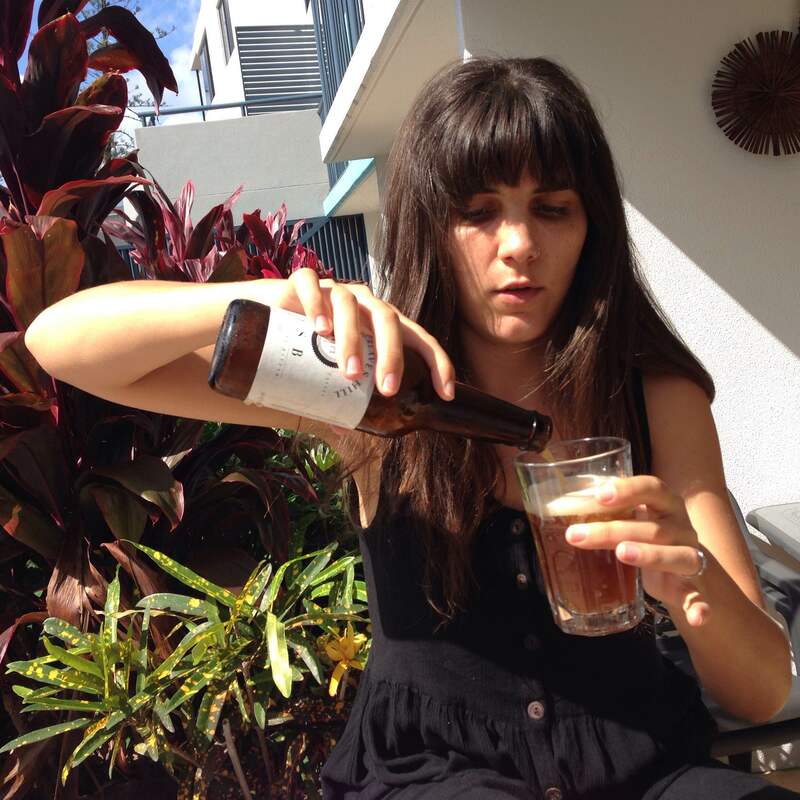 Read: the perfect opportunity for spa beers! We began with Erik the Red, by Mikeller. 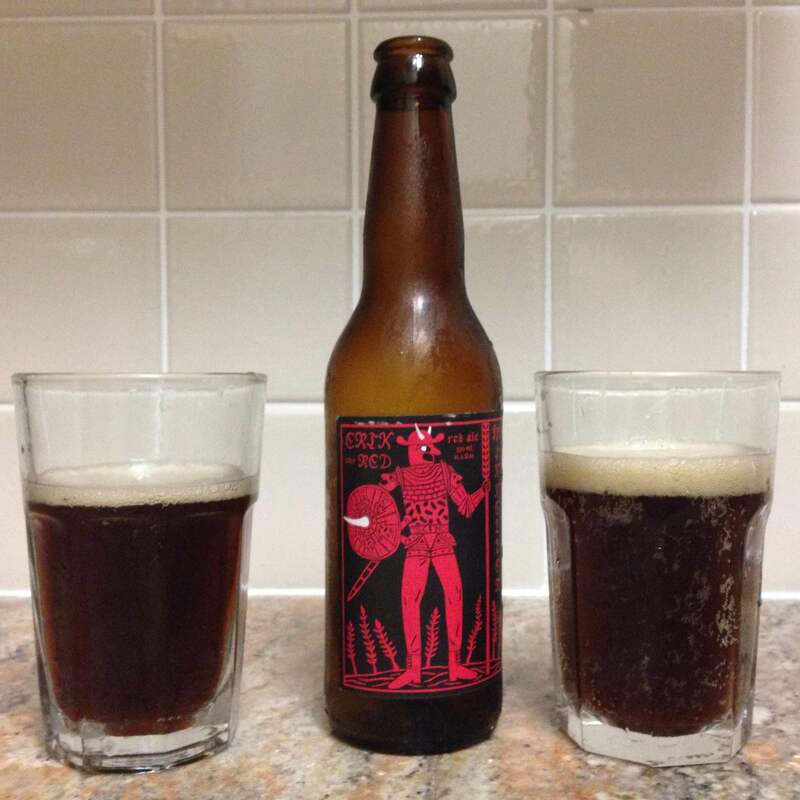 I heard of Erik the Red quite some time ago, and I’ve had it on my wishlist ever since. But when I finally got a chance to try it, it didn’t hold up to my expectations. I’m actually hoping it was a bad bottle, and not how it usually is. The nose was very promising: sweet fruits, red berries, beautiful red ale pickings. But the drink itself delivered mostly just bitterness. Not what I’m after in a red ale. I’ll certainly give it another try if I get a chance, just in case. But for now, at least, it was a let down. The Santa Paws was also a little bit of a let down. It wasn’t bad. There was nothing negative about it. The flavour was nice enough, but it lacked body. It had whispers of a complex and boozy scotch ale, but I reckon it could’ve done with another 3 or 4 percent ABV to give it some more oomph. 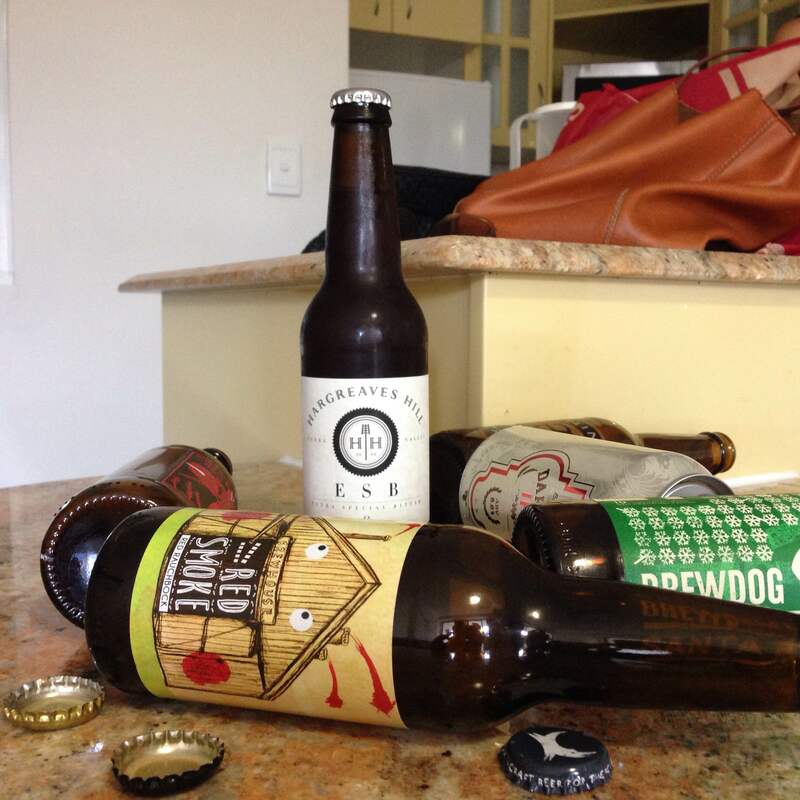 The next morning, as we packed up to leave our apartment and head home, I remembered that we’d only had 5 of the beers we’d brought. 5 down, 1 to go. Morning beer, here we come! So we sat outside and cracked it open. The smooth subdued toffee and soft bitterness brought on a satisfied “Ahhh…”, as the warmth from the morning sun washed over us and the cool beer trickled down our throats. The occasional morning beer sure does work wonders for the soul. 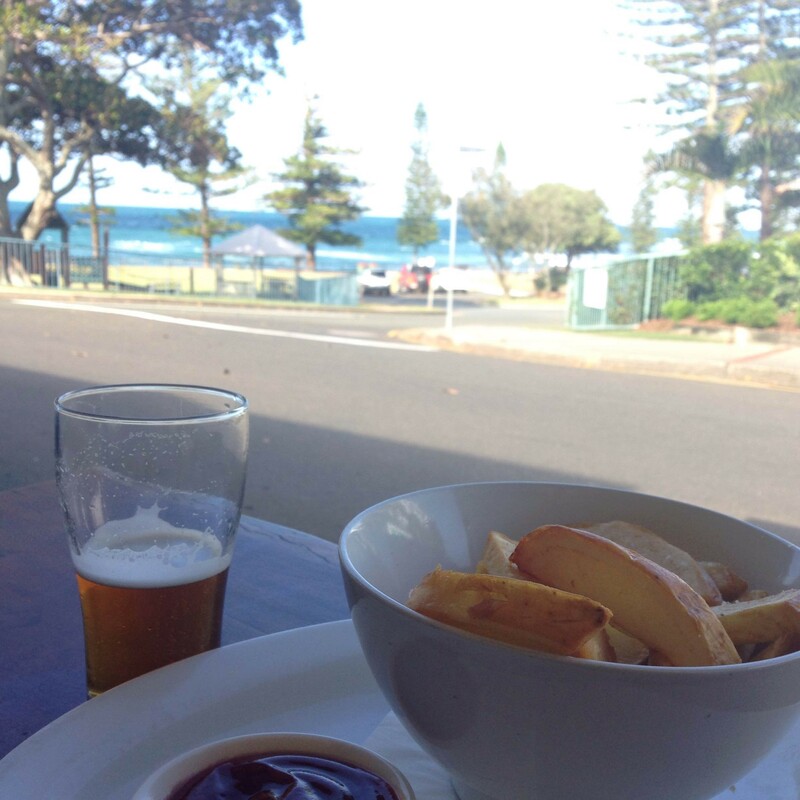 With our final bottle finished, we headed home (stopping off for some final chips before we left the beach, of course! )(okay I might have a problem). But just because our time at the coast was over doesn’t mean our anniversary weekend was over. 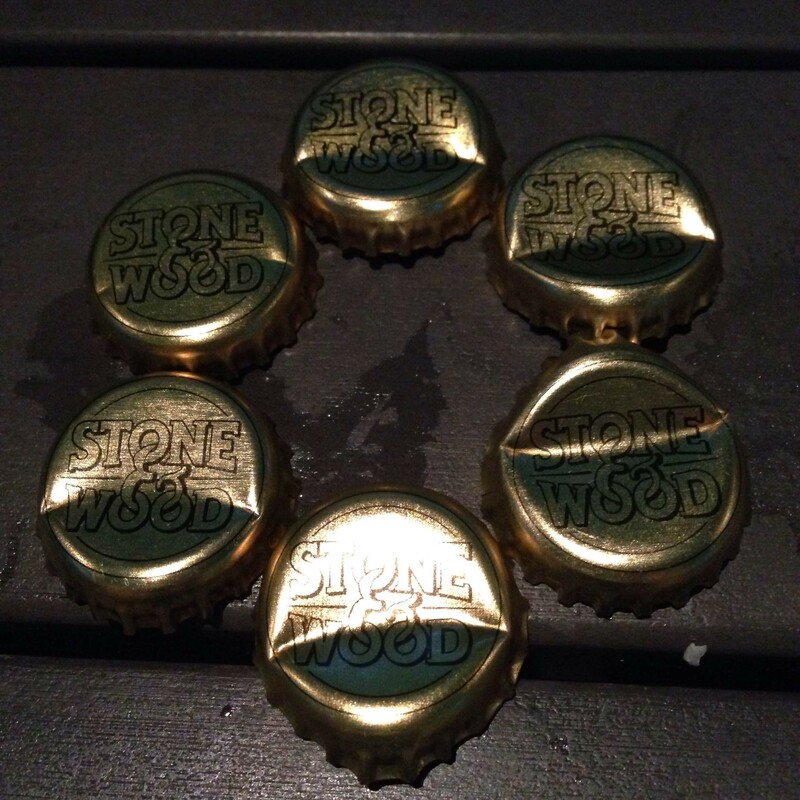 That evening we got together with some friends of ours to taste our way through the Stone & Wood range. That’s just the way we roll. 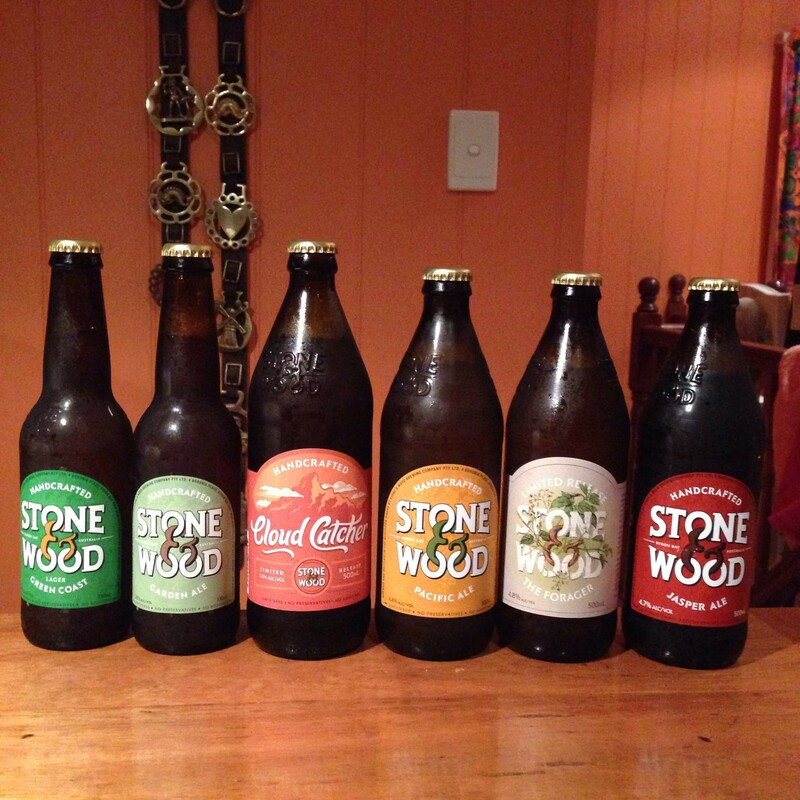 The Stone & Wood range, just waiting for us. With love and laughter and concentration and light-heartedness, we enjoyed the soft floral notes of Garden Ale; the cloudy, ripe banana goodness of the Green Coast Lager; the rich apricot smell, and soft apricot flavour of the Cloud Catcher, chased up by its gentle bitterness; the passionfruity twinge of the classic Pacific Ale; the smooth chocolatey caramelly Rolo-tasting velvet of the Jasper Ale; and finally, the spice and tang of the Forager. They capped off the weekend beautifully. And that was the end of our seventh anniversary celebration weekend. 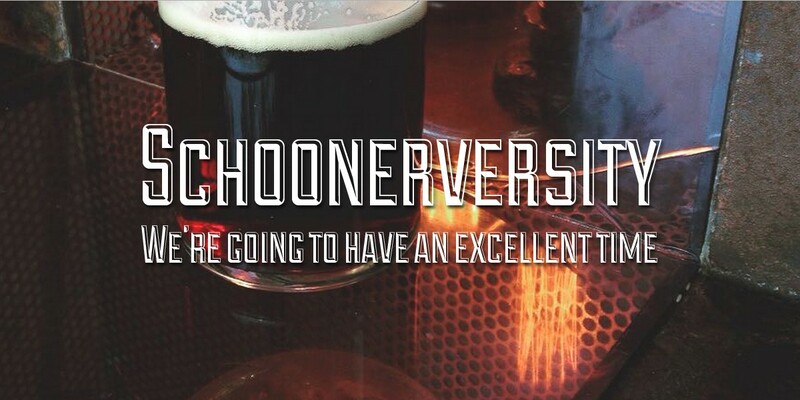 From before I even sat down to write this post, I thought ‘7 Beers for 7 Years’ had a really nice ring to it. But there was just one problem: whichever way I tried to bend it, however I tried to justify or categorise it, I couldn’t make it total 7 beers any way you look at it. 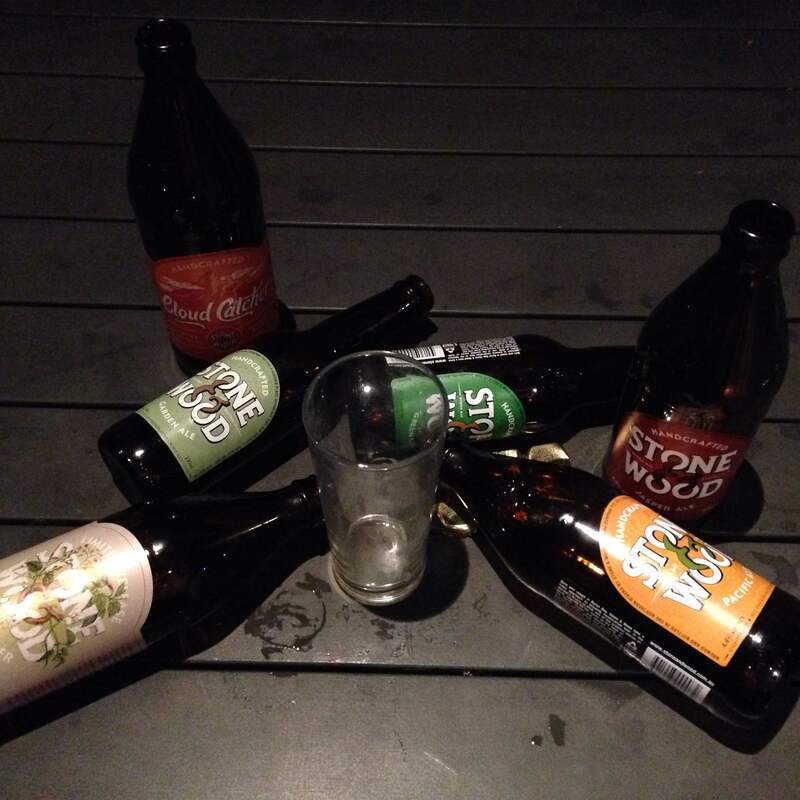 We took 6; we drank 2 out; we had 6 once we got back to Brisbane. I decided to stick with the title out of sheer stubbornness and creative frustration, but alas, the ‘7 beers’ part of the title is false. P.S. 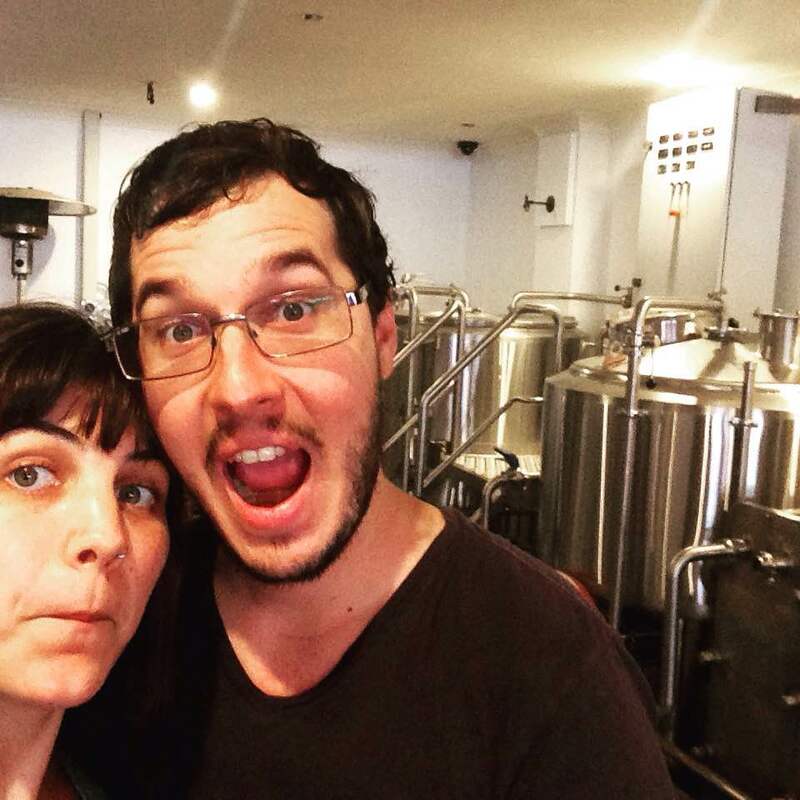 After thinking about this title for over two weeks, I just realised while writing this post that we tasted 7 beers on our actual anniversary (the last day). Whaddaya know—the title works after all!